GREAT BAY NATIONAL WILDLIFE REFUGE, N.H. — In the twilight before moonrise, a faint shadow swooped overhead and into the surrounding bower. Dave Yates switched off his headlamp and quietly signaled for his fellow wildlife biologists to stop. They waited a few minutes before approaching one of the large traps they had erected along a winding trail. Yates aimed his headlamp into the October night illuminating their quarry: a big brown bat. He carefully untangled the furry creature’s wispy wings, pointy ears, and sharp teeth from what looked like a volleyball net. 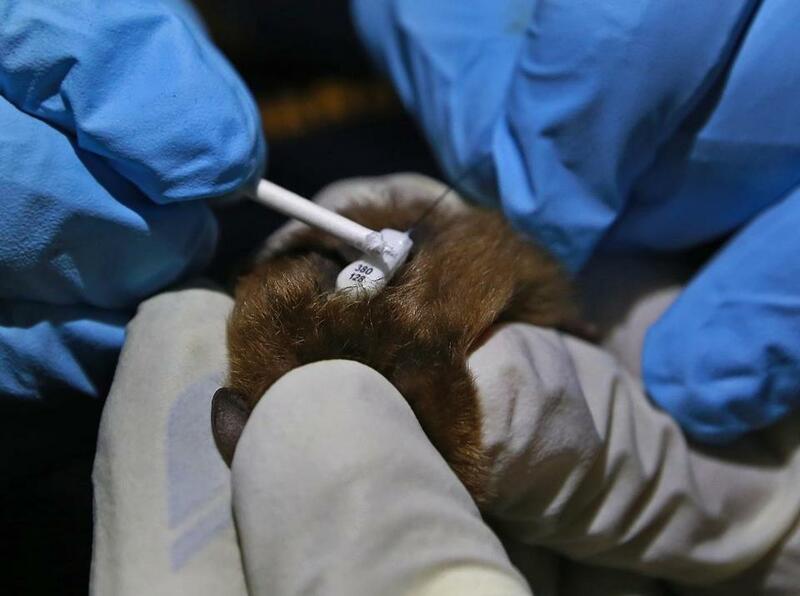 It was the 73d bat caught since August by Yates and his US Fish and Wildlife Service colleagues, who have been attaching special radio transmitters to the flying mammals to better understand and protect creatures that provide significant economic benefits. An estimated 90 percent of Northeast bats have been wiped out in recent years, mainly as the result of a rapidly spreading fungus known as white-nose syndrome, which ravages the muzzles and wings of those hibernating in caves. Others are falling victim to proliferating wind turbines. They confuse them for trees and have been killed in increasing numbers by flying into their blades or being knocked out of the sky by the turbulent air. The toll has been so precipitous that federal officials are considering some species for protected status, including long-eared bats, which could be listed next year as endangered. David Yates a contractor with the Fish and Wildlife Service removed a bat that was caught in a mist net in the Great Bay National Wildlife Refuge. An estimated 90 percent of bats in the Northeast have been wiped out in recent years, mainly due to a rapidly spreading fungus. 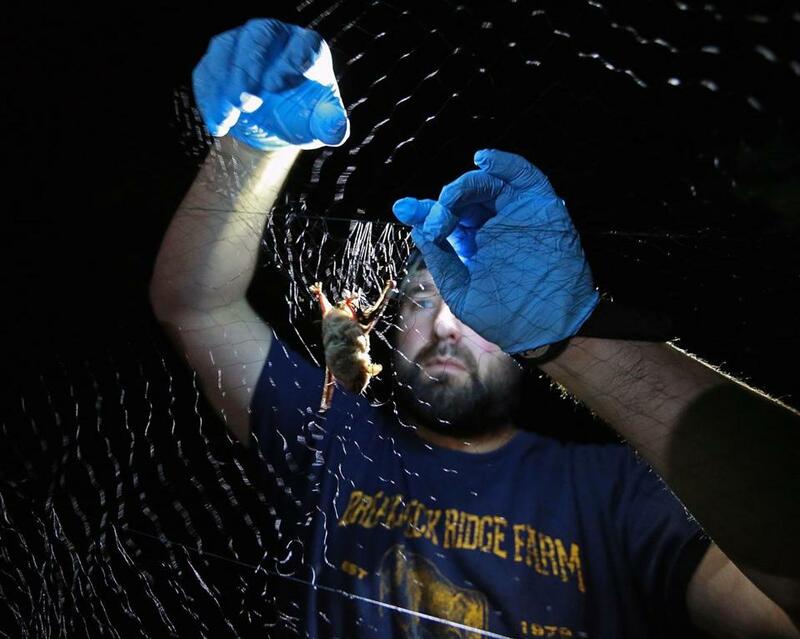 In a wetland area in the Great Bay where bats spend their days dozing on trees, the Fish and Wildlife Service installed a system of nets to catch and tag bats as they spend their nights coursing along the trails, where they forage for moths, mosquitoes, and other flying insects. Using telemetry towers along the East Coast from northern Canada to Virginia, which receive signals about air speed and direction from the tags, the biologists hope to learn when and where bats migrate. They know very little about their flight patterns or where they spend winters, because the animals move at night and their calls are inaudible to humans. Better information about migration could potentially help scientists combat white-nose syndrome, which has killed at least 7 million bats and has spread to 25 states and several Canadian provinces, federal officials say. It could also help reduce mortality from wind turbines, which studies have shown kill as many as 900,000 bats a year in the United States. By learning where bats hibernate, scientists could study how differences in caves affect survival rates of white-nose syndrome. They might also be able to disinfect caves, depending on how long the disease has been prevalent there. The data could also help officials better determine where turbines should be built, and whether existing ones should be switched off at different times of the year. It would also help them manage forests and protect areas where bats roost. Already, preliminary data show that the bats feed through the night, rarely taking breaks; in the fall, however, they forage for only a few hours after dark. “As we think about how to conserve them in the future, this basic information is necessary,” said Nancy Pau, a wildlife biologist with the Fish and Wildlife Service, which has spent nearly $20 million in recent years to better understand bats. It is an investment the winged mammals more than pay back. A study by scientists from the US Geological Survey in 2011 estimated that bats save US farms as much as $53 billion a year in pest control. They found the loss of bats in the Northeast had resulted in as much 1,320 metric tons of insects annually that are no longer eaten. But Yates said the bats’ value goes beyond economic benefits. Several years ago, before white-nose syndrome began taking such a heavy toll, Yates’s team would often capture as many as 30 bats a night. Now, with the population decimated, they were just hoping to land one. When they finally found the big brown bat, the last of this year’s effort, they went through the tagging routine quickly. As soon as Yates freed the bat from the mesh trap, it pecked and clawed at his gloved hands. He checked the bat, a female, for pockmarks and discoloration on its wings — signs of white-nose syndrome. But it looked healthy, and in a good sign, had recently been nursing. He handed the creature to a colleague, who held it as Yates shaved some fur from its back, applied a cement glue, and attached the transmitter with a cotton swab. The bats frequently bite the biologists, and they have the scars to show for it. Team members wiped down their equipment with disinfectant — just in case it was contaminated with the fungus that causes the disease — and then dropped the bat into a cloth bag to allow the glue to dry. Fifteen minutes later, Yates reached into the bag and held his hand in the air. The bat waited a few long moments before flapping away into the night. 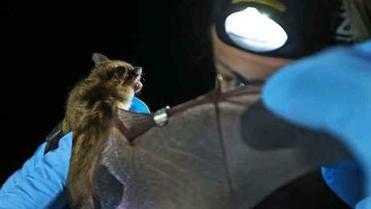 David Yates attached a tracking device on a bat that was caught in the Great Bay National Wildlife Refuge.